ATLANTA — Madison Harris came home from World War II as a veteran of the army that helped free Europe and Asia from fascism. But the city he returned to was still a bastion of Old South segregation, and on the clanking streetcar he boarded one wet April evening in 1946, the separation of the races remained absolute. Blacks crowded in back; whites up front. When Harris stepped off, witnesses said, the 21-year-old left by the rear exit, as blacks were required to do, and appeared to be unarmed. Harris had walked only a few steps before the white conductor opened the front door. “Boy, give me that gun,” the driver yelled. Harris raised his empty hands in the air, but the conductor fired his .45-caliber revolver anyway, witnesses said. Harris died instantly from a single shot to the left temple. The killing drew some local notice — and crowds to the courtroom — but soon the story of Madison Harris was nearly lost in time. Now 70 years later, a civil-rights team at Northeastern University has dug it up again, a fragment from what seemed a distant time in the long, brutal history of race in America. Now, after the fury over the deaths last summer of unarmed black men in Missouri and New York, it doesn’t seem so distant at all. Since 2007, Northeastern law students have documented about 350 racially motivated killings, often by piecing together obscure clues buried in government archives and newspaper clippings. It is painstaking work, aided by Northeastern journalism students, in pursuit of a simply stated but staggeringly ambitious goal: to identify every racially linked murder in the South between 1930 and 1970. And it’s work that led to Madison Harris, a young man of such little prominence that the few news outlets mentioning the killing did not report his age correctly. The trail to Harris was uncovered by Alex Cherup, a third-year law student drawn to the task by its mission and the leadership of Margaret Burnham, a Northeastern University professor who worked for voting rights in Mississippi during the violence-plagued summer of 1964, became the first black female judge in Massachusetts, and was appointed by Nelson Mandela to help investigate human-rights abuses in South Africa. 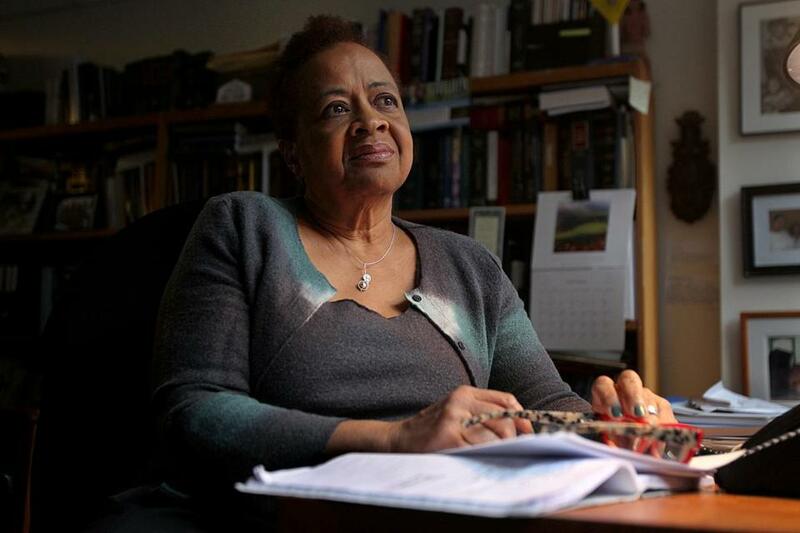 Margaret Burnham, a law professor at Northeastern University, is founder of the Civil Rights and Restorative Justice Project. But bringing to light forgotten murders of the segregation era, Burnham said, is the most important work of her life. Cherup’s investigative odyssey began in May 2013, when he was handed a file with a few scraps of information about three unrelated killings. Cherup was told to choose one of the cases — none of which involved Harris — and settled on the 1946 death of Walter Lee Johnson, a black World War II veteran killed by a white Atlanta streetcar conductor. Cherup was caught up in the assignment, both because of the arbitrary suddenness of the killing and the fleeting public attention it received. In 21st-century America, Cherup knew, such a shooting can ignite violent national controversy. Johnson had been an Army veteran of the Red Ball Express, the nickname given to the mammoth, constantly moving convoy of trucks that supplied American soldiers as they rumbled across Europe toward Germany. But less than a year after returning to Atlanta, Johnson was fatally shot in the abdomen. In the moments before the shooting, Johnson had stood on a downtown sidewalk and shouted, “Straighten up and fly right!” to a friend passing in an automobile. The expression came from a popular song by Nat King Cole, but the conductor in a nearby streetcar apparently thought Johnson had been taunting him, witnesses said. Incensed, the conductor stopped the streetcar and strode up to Johnson. “Repeat those remarks,” he snapped. A scuffle followed, and the conductor shot Johnson. Other armed whites then chased the wounded man up the street as his friends desperately tried to carry him to a hospital. Johnson died the following morning, leaving a 3-year-old child and a pregnant wife. During his research, Cherup learned that the shooting, at a site now buried by concrete near the Georgia Dome football stadium, was not an isolated spasm of violence. He read of frequent police brutality against black veterans in 1946 and of a lynching that summer in which four blacks, one of them a veteran, were killed 60 miles east of the city. 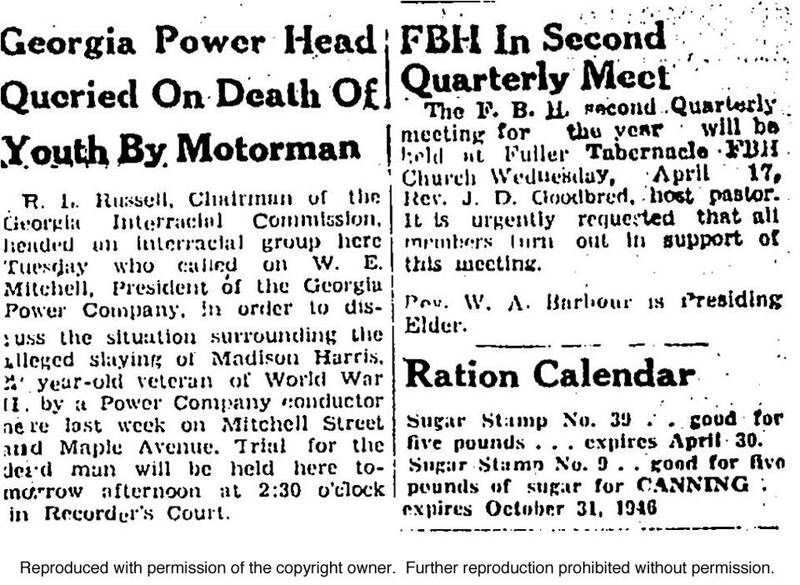 And he read, almost as an aside in a news article, that a few months before Johnson’s death an Atlanta streetcar conductor had killed another black veteran — Madison Harris. All of Atlanta’s streetcar conductors were white and armed at the time. Callaway, the judge who called Harris’s death a justifiable homicide, reached the same decision in Johnson’s case. “No jury on Earth would convict him,” Callaway said of W.D. Lee, the motorman who fired the shot that killed Johnson. Cherup was stunned by the casual cruelty of the cases, plainly fueled by racism. “These were stories that needed to be told, and had not been told, and were not going to be told, more than likely, unless we took action,” Cherup said. An article from the Atlanta Daily World about the shooting of Madison Harris. Documenting the killings is one part of Burnham’s task. Another, more difficult part is gaining a belated measure of justice — or even acknowledgment — for black men and women victimized decades ago by a Jim Crow system that valued life according to skin color. The Northeastern team’s latest success occurred Wednesday, when a South Carolina judge exonerated a 14-year-old black youth who had been electrocuted in 1944 in the deaths of two white girls. Burnham’s group fought for the decision, in which the judge ruled that George Stinney Jr., the youngest person executed in the United States in modern times, had been denied due process. Now, in Atlanta, Burnham and the restorative justice project’s team believe they have found a vehicle for another public reckoning: the city’s streetcars. The transit line run by Georgia Power Co., whose conductors shot Johnson and Harris in those troubled postwar years, was discontinued in 1949 as the city grew and changed. Buses took over, and commuter rail knitted the city with its expanding suburbs. But after disappearing for 65 years, Atlanta’s streetcars are set to reemerge in a $99 million project that mixes traffic-thinning pragmatism with nostalgia for a simpler time. And in a move that city officials insist is not coincidental, the 2.7-mile streetcar loop will connect downtown with Atlanta’s most important civil rights landmarks, including the Martin Luther King Jr. National Historic Site. For the Northeastern team, which had not known about the streetcar restoration effort when Cherup began his work, the timing is ideal. The new line, and the feel-good publicity surrounding it, provides an opportunity to educate or remind Atlantans about the city’s past, Burnham believes. One tool could be an informational plaque on the streetcars about past segregation. Another option is to commemorate the deaths of Harris and Johnson with memorial markers. That era was a time when black riders were forced to crowd into the back of the streetcars, when the line between the races, an imaginary barrier that moved according to how many seats were needed for whites, was enforced by a deputized conductor with a handgun on his hip. In Atlanta, at the National Center for Civil and Human Rights, two large photographs starkly capture the consequences of that forced separation of human beings: The faces in the photographs — black and white, riding through the streets of the city — are individual studies in dour, sullen discomfort. Atlanta public transit in the 1950s. Since those days, Atlanta has been transformed: The police force was integrated in 1948. The buses in 1959. And the city has had an unbroken string of black mayors since 1974. 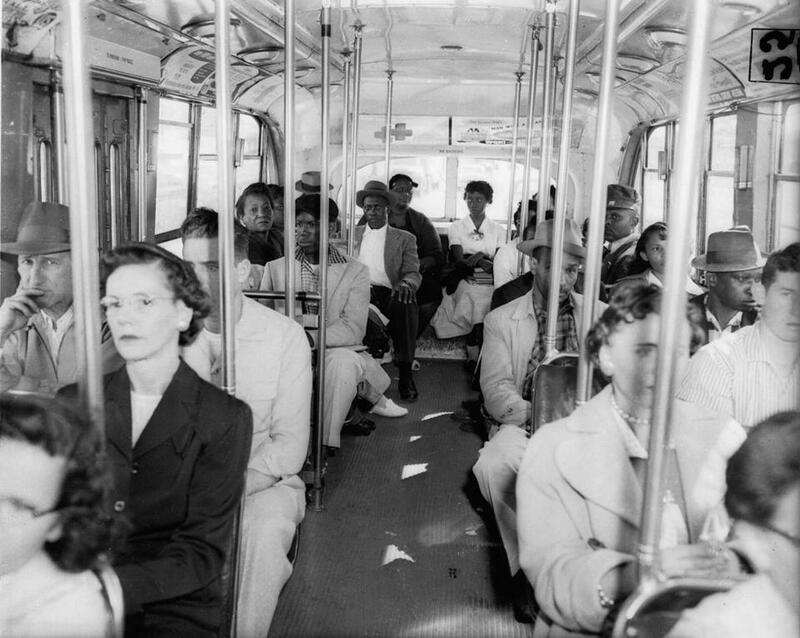 And soon, for the first time in more than a century, black passengers on Atlanta’s new streetcars will be able to use any seat they wish, front or rear, without being humiliated, beaten, or shot. Some in Atlanta embrace the Northeastern group’s idea of using the new streetcars to acknowledge the past. “I’m fascinated by it. We would be eager to get more information . . . to think about how to incorporate history into this,” said Tom Weyandt, who was the city’s deputy chief operating officer when he spoke with the Globe. He has since retired. “Certainly, this piece of history has been forgotten by some of us,” he said. The dean of Georgia’s black state legislators, Representative Tyrone Brooks of Atlanta, did not know of Harris’s killing, despite decades of work in civil rights. Nor did M. Alexis Scott, publisher of the Atlanta Daily World, a newspaper founded by her grandfather in 1928 to serve the city’s black population. Or Hamin Dawan, who fought in Vietnam as a combat infantryman and is now commander of Atlanta’s chapter of the National Association for Black Veterans. It is unclear whether there is any record or memory of that history at Georgia Power, the company that operated the old streetcar line. The company did not respond to repeated questions about Northeastern’s findings or about whether the company or the city should in some way acknowledge Harris’s and Johnson’s deaths by Georgia Power’s former employees. Eight hundred miles to the north in Allentown, Pa., is a modest ranch house where Carlton Shockley sits on a living-room couch, surrounded by patriotic mementos, among them his paratrooper’s beret from the 82d Airborne Division. Shockley scans article after article from the Atlanta Daily World of 1946 that Cherup compiled during his detective work. The 52-year-old veteran had heard as a child that Uncle Bud, as the family called his great-uncle Madison, was shot on a streetcar shortly after World War II. But until this moment, Shockley had never known the details. “Justifiable homicide,” he reads aloud. The words stop Shockley, shock him, anger him. He lifts himself from the couch, takes four paces toward the front window, and covers his face with his hands. 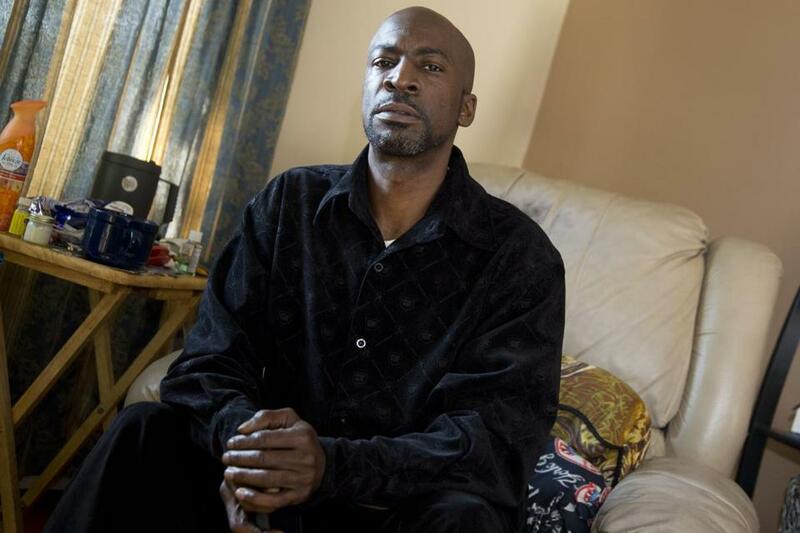 Carlton Shockley was photographed Nov. 3 at his home in Allentown, Penn. Harris served in the 569th Ordnance Ammunition Company during nine months of duty that ended in November 1943 with a medical discharge and a government-paid trip to Georgia from Yuma, Ariz.
His great-uncle was a jokester, Shockley said, a young man of medium build who was proud of the deep, dark color of his skin. When Harris came home, he found a growing city on the move, but one where the only work he could find was as a domestic. Frustrated by the prospect of a lifetime of bare-bones wages, Harris asked a black veterans group in March 1946 whether he could join an apprentice program for the dry-cleaning and pressing business. He never got the chance. The next month, he was dead. The shooting devastated Shockley’s father, to whom Uncle Bud had been a surrogate big brother and constant companion. In the aftermath and shock of the killing, the ties that bound the family together frayed. Harris’s sister — Shockley’s grandmother — moved her children to the Bronx to escape the Atlanta of Jim Crow. Another sibling traveled to Detroit. Shockley wants an official acknowledgment of Harris’s death but says that will not define his great-uncle’s legacy. Instead, to his relatives, Harris is linked in a richer way with what his great-nephew called “the family business” of US military service. That “business” is now in its third century. Some of the family fled north during the Civil War to fight for the Union. Others served in World War I, and three of Harris’s brothers saw duty in Europe during World War II. Later, Shockley and five siblings entered the military, including a sister who remains an Army master sergeant. A niece is an Army major who served in Afghanistan and Iraq, and Shockley’s two sons have chosen the Air Force. “We’re going to continue to serve this country, because we’re not going to let the bigoted views of a few prevent us,” Shockley said. One of his sons, 18-year-old Emmanuel, enters the living room as his father finishes speaking. Quietly and politely, the teenager greets a visitor with a firm handshake and a smile. Emmanuel does not have a ready reaction to Harris’s death, a lightning flash of violence so remote in time and place that it does not seem real. Still, he searches for an answer that will honor the legacy of a great-great-uncle, barely known, who served his country and died too soon. Globe correspondent Alexa Mills contributed to this report. Brian MacQuarrie can be reached at brian.macquarrie@globe.com.